I love paper. I love my sewing machine. And I love animals. My English mother-in-law also loves animals. She raised and bred award winning dachshunds for many years. 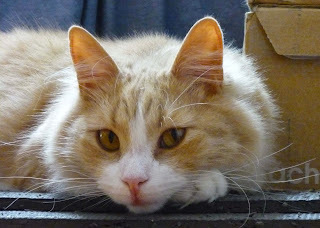 Mitsy unfortunately has passed away but her beautiful spirit continues to live in our hearts. I gave my mother-in-law this mixed media painting and it is hanging in her kitchen today. I sewed (zig-zag stitch) together pretty scraps of Japanese origami paper. I didn't fuss over cutting the paper into perfect squares. 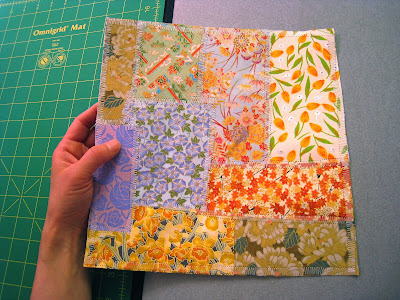 I just wanted the background quilt to be an easy patchwork of happy colors that would complement Mitzy's fur. Instead of watercolor, I used acrylic paint on Claudine Hellmuth Studio Sticky-Back Canvas (Ranger). The sticky-back canvas is easy to cut and the self-adhesive backing is pretty strong. 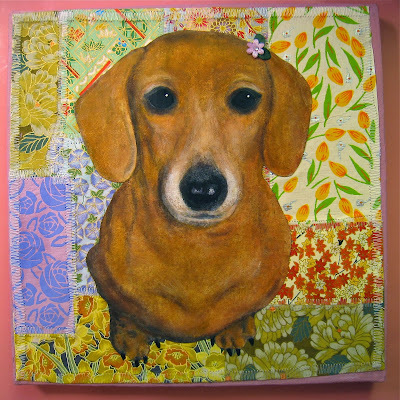 It was simple to position Mitsy onto the paper quilt background. I have to say that capturing the eyes are the most challenging part when doing a pet portrait. Finally, I glued everything down with gel medium (tip: use a brayer) onto a square wooden canvas board. That's Dooley love, my westhighland terrier soul mate. He's in the big dog park in the sky now but when I think of him, I can't help but laugh. To say he was a character is a massive understatement. I got to thinking about the three animal family members I've had the good fortune to live with in my lifetime and quite frankly, I'm convinced that each one was an absolute gift wrapped up in a little fur body. 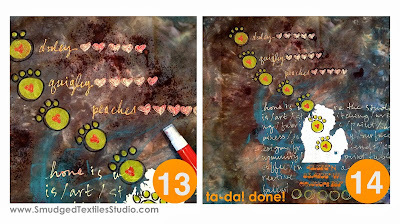 It was a no brainer that I would print some paw prints on my fabric sketchbook. I decided to go the freezer paper stencil route this time to get the pattern down, it's a super simple trick for printing shapes easily. 1. 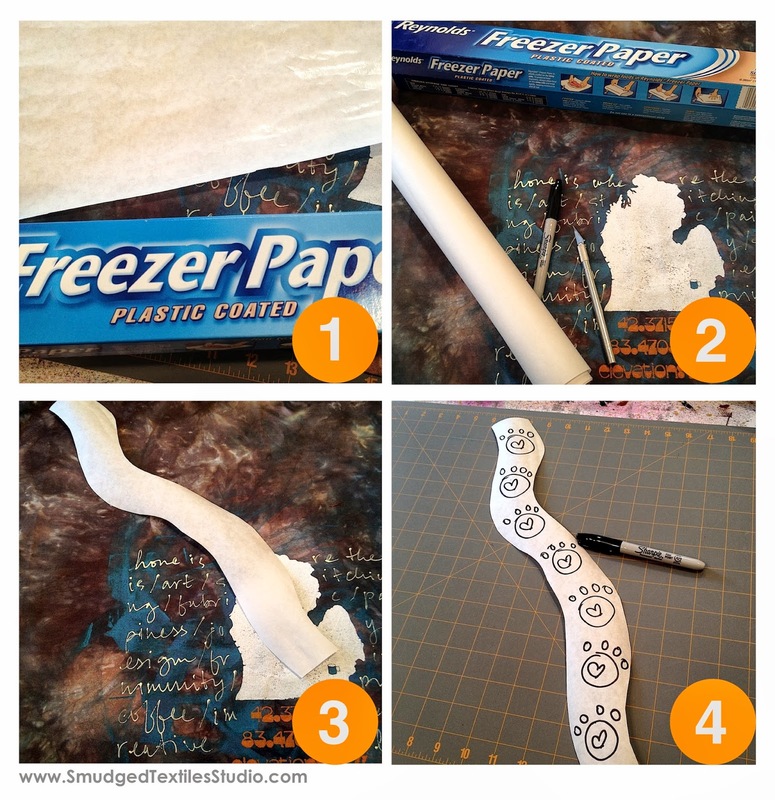 Freezer paper stencils are made from, well, freezer paper. Pick it up at the grocery store. It's the plastic coating that makes it stick to fabric. 2. Supplies needed: freezer paper, sharpie, an exacto knife and a cutting mat. 3. 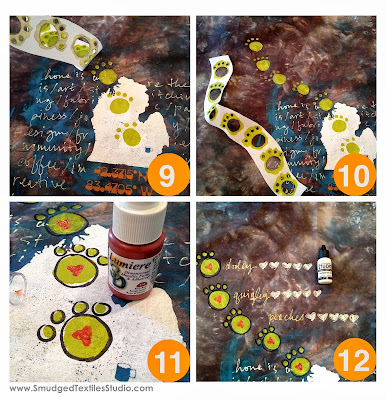 I cut the freezer paper to the "path" that I wanted the paw prints to march across the fabric. 4. I drew the pattern on the paper side of the freezer paper. 5. If you've cut stencils before, you'll have noticed my fundamental flaw in having the heart in the middle of the paw. That's okay, we'll add it in another way. 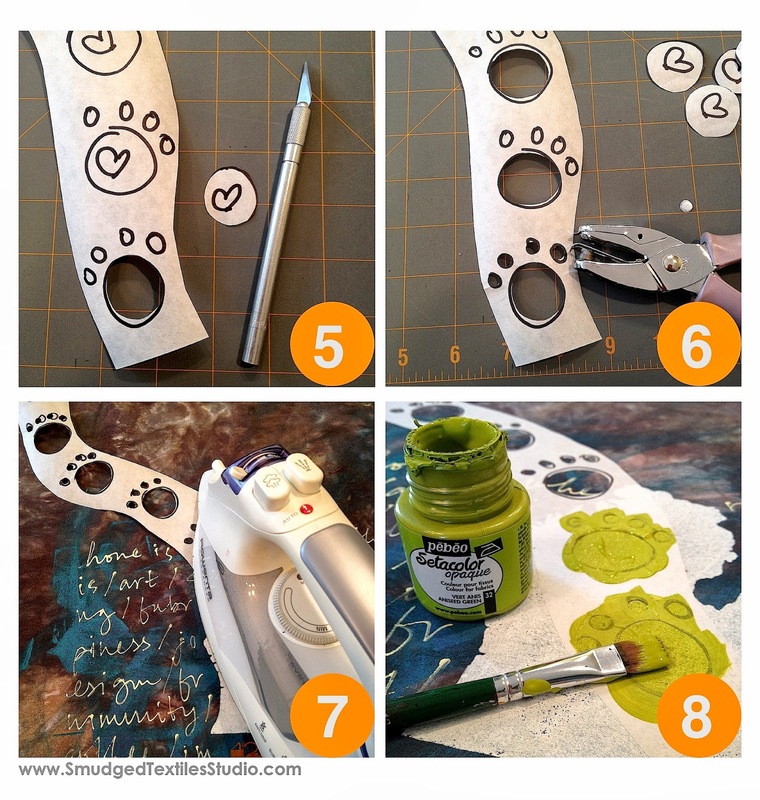 Cut the big part of the paw out with the xacto knife - carefully! 6. I used a hole punch to "cut out" the toes of the paw. Much easier. Trick is to make sure the width of the stencil is narrow enough that the punch can reach all the way to where you need it to go (learned that one the hard way). 7. Set your iron to no steam and give it a good press. Yes, you can iron freezer paper stencils over painted areas, just make sure the previously painted areas have been heat set first. 8. Once it's stuck, take a paint brush and paint in the open areas of the stencil. 9. Peel the stencil off before the paint dries. Easier to get it off. 10. Reveal the gigantic King Kong sized paw prints tromping across Michigan. 11. Using Lumiere 3D paint by Jacquard, I drew the little heart in the middle of the printed paw prints (after the green paint dried of course). I also outlined the paws in black marker to give them some more presence. 12. I wrote each of my animal family member's name along with some more hearts. Love my little doggie friends. 13. I misted some red over top of the hearts to get some more Love color in there. 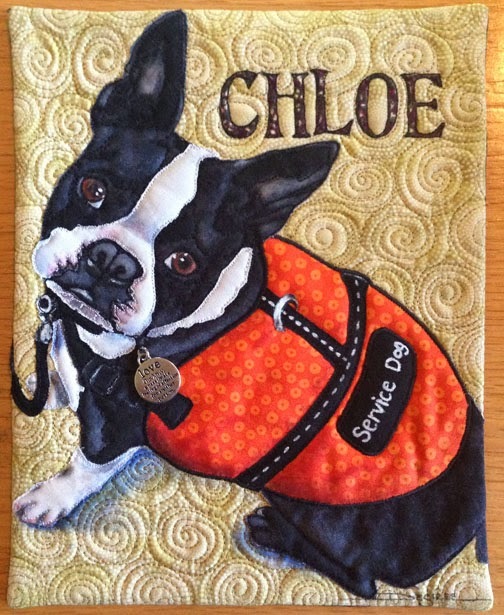 I really loved being able to make a little tribute to my fur friends! Do you have animal family members? Have you ever made art to honor them? 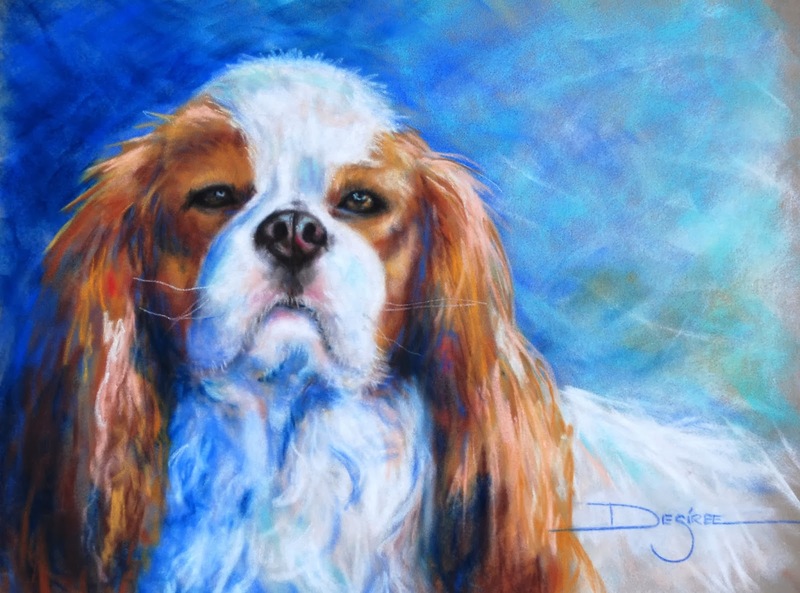 Animal Companions- each line and brush stroke tells a story. Hi everyone, Desiree Habicht here! I love this months theme, Animal companions, I have painted so many over the years it was hard to narrow down what pictures I would post! I have sketched, quilted, painted animals of all kinds. My house has always been full of animal lovers and animals. When our children were younger we raised horses, dogs, goats, cows, bunnies and chickens etc, you name it we probably had it. Jennifer went on to work for a vet and managed a no kill shelter where we often fostered animals until they found good homes. 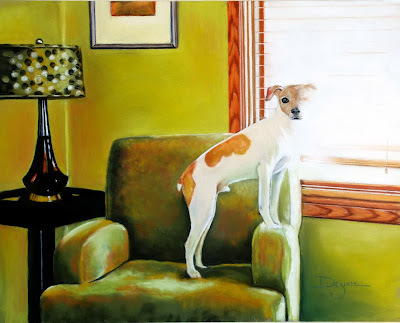 I love to paint animals but I love the story behind the painting even better. Every time I paint something there is always a story, a personal story, a visual story but a story. One of the great things about our sketchbooks is that we can also journal the story along with drawing and painting the sketches. I have been telling my stories and others peoples stories for a long time, and I love it! Are you journaling your stories? At one of the animal walk fundraisers for the shelter I quickly sketched some of the dogs there. The owners are so excited to share their wonderful rescue stories. I often am commissioned to do animal portraits, because people just love their pets. Our pets give us an unconditional love that we can get no where else. They offer comfort and love without judgement, and are always happy to see us. 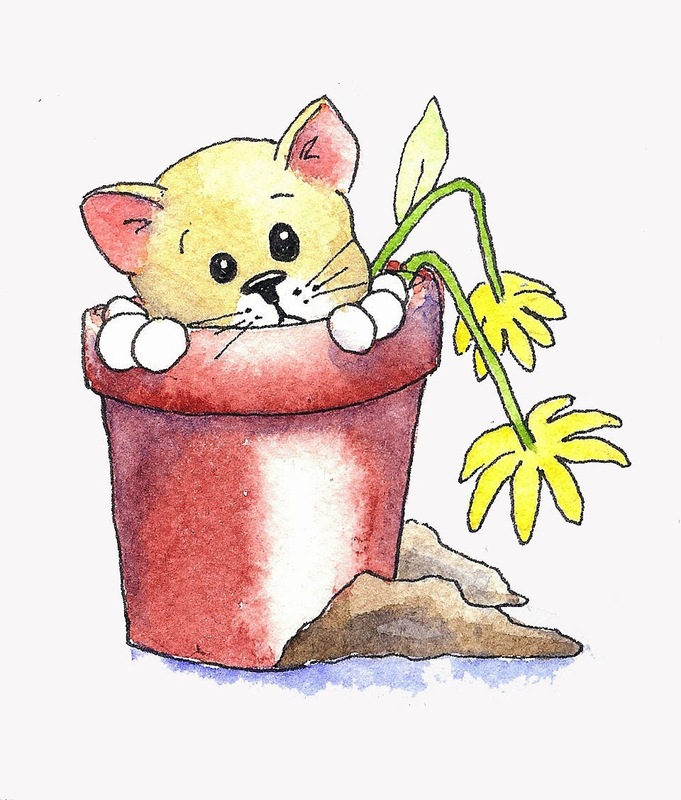 The tricky part can be getting them to sit still long enough to draw and paint them. This painting is called "One eyed Jack". Jack only has one eye and the light from the window was so bright it made that side of his face disappear which I loved for my pastel painting. Because I love to paint animals so much I paint them in many different styles from whimsical, to realistic and everything in-between. I always use a camera or my phone camera, which I always have on me, to capture my subject and freeze them. If they lay down or are still I like to do quick life study drawing as practice. 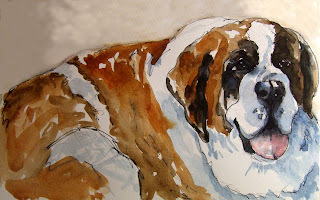 I often use these later to help me capture the animals personality and likeness for a more complete sketch or painting. 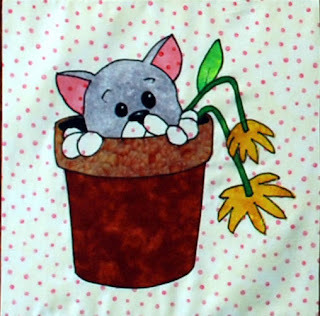 I have also included animals in the fabric I have designed, making them whimsical and fun or turning them into quilt patterns. I have many whimsical quilt patterns that are all about animals on my website if you would like to check them out. I recently did a little quilt for Quilting Arts magazine, you will be able to see it in the magazine March 2014. It is of Chloe, our Boston Terrier that Jennifer trained to be her service dog. People are always amazed when they see her. Boston Terriers are very high energy dogs but when Chloe has her vest on she knows she is working and is all too serious. Fabric, paint and a love charm! She hangs on Jennifer's every word and although in her early days of training our mail was often delivered with holes and slobber she learned. She is anxious to please and loves her job. She is our pet, but she is Jennifer's everything, they are inseparable. That is what a companion is all about. 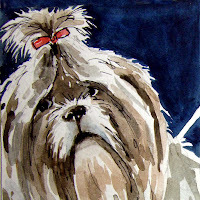 As you can tell, I love to sketch, paint and sew animals, they are wonderful subjects in any style or medium. They are special companions in this life, sharing our homes and we sharing theirs. I can't wait to see what all of you have sketched or painted this month and learn more about your stories! I also just posted a sketch and story of a cute rescued dog on my blog, I hope you will pop over and read his story and leave a comment, its so nice to hear from all of you!! 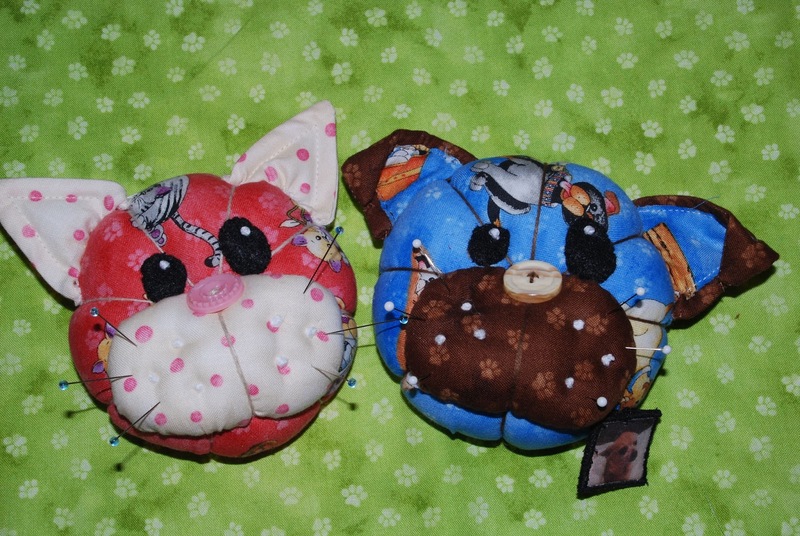 Look for my free downloadable PDF Pincushion Pets pattern on my blog and sign up for my Newsletter! Happy Sketching. Or should it be "The Human as the Animal's Companion"? Carol Sloan here, writing about this months theme. I love Mary Beth's take on animal companions. relating to my kitty, KC (AKA Baby Kitty). 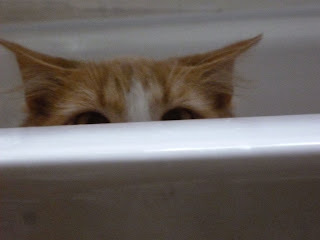 I've shared a little bit about him on my personal blog, talking about the way that he barged into not only my home but my heart as well. sights on living with us. Skinny, full of fleas and rather suspicious. and surprise us when we walk in. KC loves to hold us hostage on the couch. He jumps up on our lap and refuses to move. I pull out my sketchbook and try to draw him but he always seems to know when I am doing that. He will move just when I am this close to getting a drawing that actually looks like him. So I wind up having several quick sketches of him in various poses of sleep (or rest). Sometimes I will write notes on the sketchbook page. How sweet he is, letting me pick his paw up and inspect it. I notice that I didn't draw all the hair sticking out from between the pads of his "feet". Perhaps he will allow me the time to draw that next time. 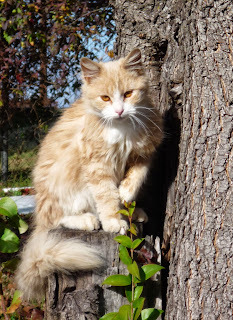 Hopefully I will go back with a little paint one day and show his beautiful pale orange color. Today he is holding me hostage on the couch without my watercolors. Let's see your animal companions over on Flickr! We don’t have any pets, unless you count tropical fish, which my husband has transported all over the country since he was a student, the tank getter larger and larger each time. He seems to be breeding catfish, which are really quite ugly, but he finds them fascinating. Living in the country most walks lead to sightings of animals, including rabbits and deer. Unfortunately some are half eaten by predators and others crushed by cars and machinery. I will spare you the photos of the rabbit which I recently photographed but you may like to see the drawings. I used one of the photos as a source in my sketchbook and drew from that. I also imported the photo to my ipad and used Sketchbook Pro, Procreate and Snapseed to trace and manipulate it. 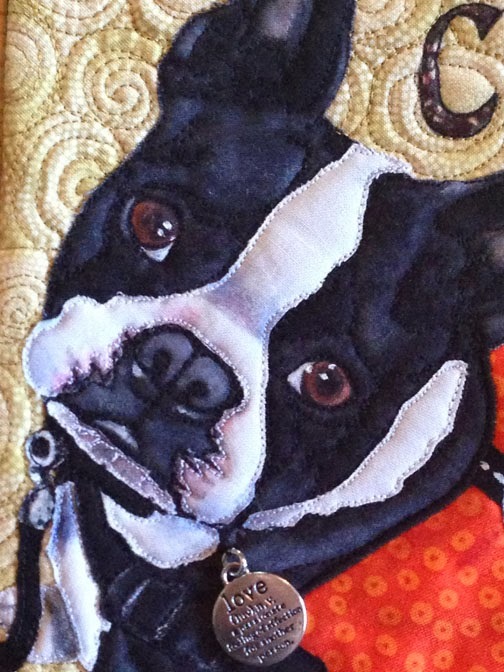 I used Lesley Riley’s TAP to transfer the images to fabric. Jane LaFazio here. I always prefer to draw from real life, in my sketchbook, but with animals, it's often impossible. 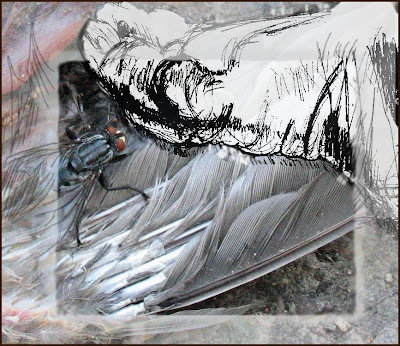 These sweet birds and deer were drawn from museum specimens. One of the members of our Sketchcrawl group, checked out the taxidermied animals from the San Diego History Museum. She invited us to her house to draw and paint them. She had two owls, an octopus, 3 birds, a deer and a turtle for us to draw. As you can see in the photo below, the animals were in plexi-glass cases. It was a great activity, and of course, it's always great to get together with friends and work in a sketchbook. San Diego Sketchcrawlers (celebrating my birthday). We usually don't wear party hats! Dion Dior here. There are benefits of being without a studio and most of my art supplies. Although I miss an abundance of choice and the freedom of a creative space to really mess up, I am loving the intricate, focused, and gentle process of art making that I am engaged in because of my current transition. Being back in Australia has enabled me to see my country with fresh eyes. My senses are heightened by the smells, the sounds, and the sites of this beautiful and magical place. 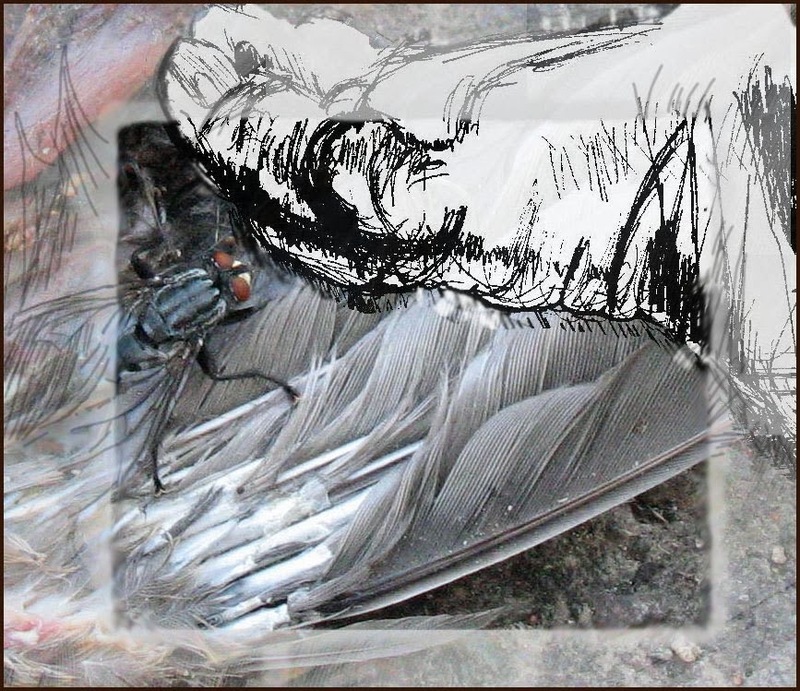 Because of this, I seem to have more of an obsession with nature than usual, and my art journals and sketchbooks are filled with all sorts of natural images. So I was thrilled to learn that the October theme for The Sketchbook Challenge is "Animal Companions". Although not officially an animal, this little beauty bug (not it's official name) was crying out to be captured in my sketchbook. The insects and spiders are of particular beauty in Australia (if you look past the creepy stuff). You never have to look far to find them either. Their colors glow and shimmer and they are very much a part of every Australian garden. Their abundance and beauty makes them perfect subjects for my Twinkling h2O's. The shimmer and sparkle of these beautiful cakes of paint are perfect for capturing these magnificent micro-monsters. If fact, I have a strong desire to fill a sketchbook with nothing but bugs and butterflies...one of the many projects I have on my agenda. In the meantime, I have been sitting at the quiet end of the dining room table, my art bag full of Twinklings h2O's, some watercolor pencils, crayons, and a palette of my treasured Sennelier Watercolor Paints, capturing these images in as much detail as I can. Sadly, the bugs will not sit still long enough for me to study and paint them, so this one was painted from a photograph. But it's a great opportunity for me to observe and then slow down and sketch with intention and proportion. The process of trying to capture a subject in it's realism is very meditative, and immensely rewarding. I use this style to practice my sketching by beginning with a light pencil sketch, then moving from light to dark using under painting and building up color and depth with translucent layers of paint and pencil. I love doing it this way, and you'll probably see more of my work emerging in this style as I move through my artistic evolution which is being fueled by change. The beetle was painted in Twinkling h2O's, and the leaves were done in watercolor paints and watercolor pencils. It was done in my Stillman & Birn Zeta Series sketchbook which has extra heavy weight, white, smooth paper. Similar to hot press watercolor paper. It is the perfect substrate for this kind of painting and really brings out the color and detail in the subject. The Twinkling h2O's can be a little tricky at times because their vibrancy and consistency is so strong, but by working them with water and gently washing and blending, I was able to build up colors and tone that closely represented the true life beetle. For this technique I needed fine tipped watercolor brushes and I have recently discovered the Rosemary & Co line of artists brushes which are out of the UK. I must say, I truly love them and would highly recommend them. If you like shimmer and vibrancy in your work and would like to learn more about painting with luminescent watercolors, then please click the workshop and classes tab at the top of this page, or feel free to drop by my blog. Happy October sketching everyone, I can't wait to see your animal companions.